Hybrid Plans work like Asset Based plans but are paid into over time like traditional plans. With a Hybrid plan, a client can choose the amount of coverage and pay equal installments over time. The premiums are guaranteed to never increase and the policy builds a cash value with each payment that comes back to the client if they ever need to cancel their plan. Hybrid plans also have a death benefit which is paid tax-free should the client not use or cancel their plan. Unlike traditional plans, Hybrid plans can be fully funded in a limited amount of time such as 10 or 20 years. This means you will have a fully paid up policy with long-term care insurance, cash value and a death benefit at the end of your selected term. Hybrid plans are one of the most popular options because they offer a benefit even if you don’t need long-term care and you are guaranteed to never see a premium increase. 52 year old male makes 10 annual payments of $10,000 into his plan. 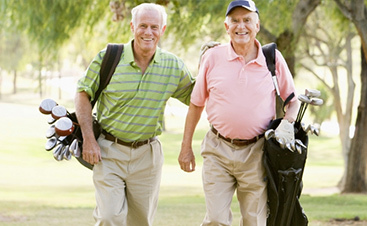 This provides him with an immediate long-term care benefit of $394,783 and an initial death benefit of $122,065. The plan will grow each year with a 3% inflation rider which is included in his plan. Note: This plan trades cash value growth and death benefit for maximum long-term care benefit. However, the client can still surrender this plan and get his money back if he chooses. The goal of this plan is to keep up with inflation and provide maximum benefit which will be paid out tax-free over a 6 year period. This plan also has the safety net of a death benefit so his beneficiaries will receive this tax-free minus any long-term care benefits paid. 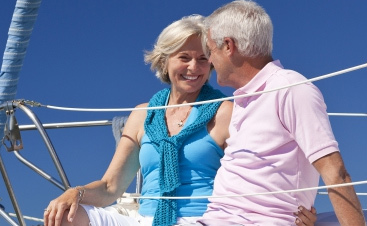 Husband 52 and Wife 49, make guaranteed level annual payments of $3,833.60 into their plan which provides them with an initial long-term care benefit of $200,000. The long-term care policy will be paid up in full after 20 years and the long-term care benefit will continue to grow as it has an inflation rider. Note: This plan is comprised of two parts that work together like some of the asset based examples. The clients will have an initial benefit of $100,000 that will be paid to them in either a long-term care benefit of $4,000 a month or a death benefit minus any long-term care claims paid. When they exhaust this initial benefit, the long-term care benefit will continue for a minimum of another 25 months. Part two has an inflation protection rider so their available benefit will continue to grow each year. Total of premiums paid will equal a maximum of $76,672 as the plan is paid up after 20 years. Regardless of how they access this plan, they are guaranteed to get a benefit out of it. 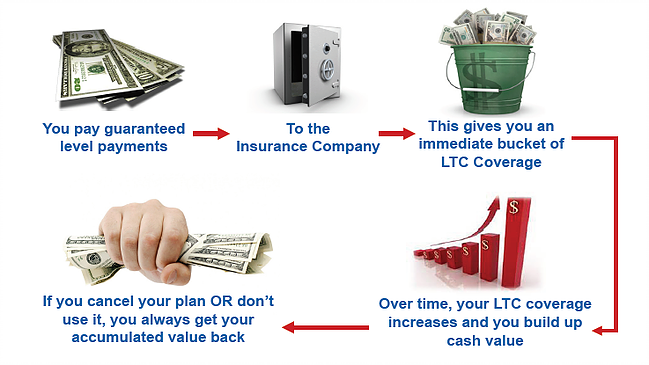 Premiums are guaranteed to remain level and they can cancel and get the cash value back at anytime. Husband 65 and Wife 64, pay guaranteed level annual payments of $7,949 into their plan that provides them with an unlimited amount of long-term care protection. Each person can pull out up to $6,000 per month for as long as they need it. Meaning if both are on claim, they will have $12,000 a month of tax-free income for life. This plan also includes a second to die death benefit of $150,000 that will be paid to their beneficiaries minus any long-term care benefits paid out. This policy will also build a cash surrender value over time. Note: The power of this plan is that it provides an unlimited benefit for each client. The premiums are guaranteed level and will eventually stop if one or both clients end up on claim. This plan provides meaningful protection against ongoing long-term care costs and allows the clients to budget as the premiums will never increase. If for some reason the clients change their mind, they will still be able to cancel and get the cash value of the policy back. The death benefit is second to die and will be paid to their estate minus any long-term care costs already paid by the company.